Restrooms and shower rooms are the hardest areas to clean and yet the most important areas to keep clean. 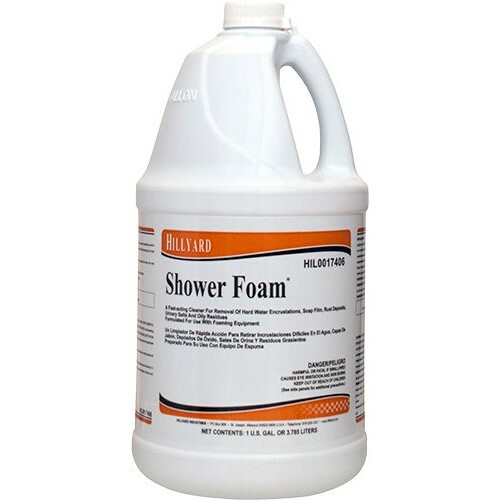 That is why Hillyard formulated Shower Foam, the fast acting cleaner specially designed for use with the Hillyard Shower Room Cleaning Kit, HIL99225. Shower Foam quickly dissolves away the weekly buildup of hard water deposits and soap film from shower walls and floors without scrubbing. High foaming Shower Foam clings to vertical surfaces while it attacks soap film and hard water deposits. Shower Foam can be used on any acid resistant surface, including ceramic tile walls and floors, bathroom fixtures, faucets and fittings, shower heads and stalls, drinking fountains, swimming pool walls, concrete, and stainless steel. Shower Foam leaves restrooms and shower rooms smelling clean and pleasant evergreen fragrance. Dilution rate 6 oz per gallon. Quickly dissolves hard water deposits and soap film. Case Specs: 4 one gallons Containers per case, sold as one gallon.